We install ramps to protect us and others (like insurance) from accidents which are very costly but more importantly potentially threatening to our or our loved ones independence. Similar to insurance, ramps must be in place prior to an accident to offer the greatest benefit. 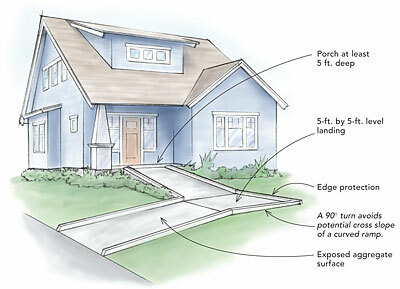 Additionally, ramps must be configured within guidelines to ensure ease of use and optimal safety. A major component of safe useful configuration is ramp rise. Ramp rise measurement simply put is the difference in height between where you enter the ramp and where you exit the ramp. How you angle and configure the ramp to bridge this dimension dictates the usefulness and safety of your access ramp. Disposal and resale of the ramp when there is no longer a need. Although we can often ball park estimates from a picture alone, generally the better the information the better the estimate. Once confident of your need, you can request an appointment with one of our representatives for a free onsite evaluation. They can prepare a professionally designed solution addressing your specific requirements. Our customers realize that preparing there personal homes to accommodate them and others safely as they age makes good financial sense and even better health sense. We at RAMPS for AIMP welcome the opportunity to assist you in that preparation in any way we can.